Streamline your development configuration using Docker with DataStax Enterprise. Make sure Docker is running. Open a terminal window and see what commands are available. If this errors then you need to start the docker daemon. Now we need to get the DataStax Images! DataStax Enterprise: The best distribution of Apache Cassandra™ with integrated Search, Analytics, Graph, and Advanced Security. DataStax Studio: An interactive developer’s tool for DataStax Enterprise which is designed to help your DSE database, Cassandra Query Language (CQL), DSE Graph, and Gremlin Query Language development. DataStax DataStax Enterprise, Studio and Opscenter are in Docker hub so getting them is straight forward. (optional) change the initial configuration. -d (Recommended) Starts the container in the background. -v Bind mount a directory on the local host to a DSE Volume to manage configuration or preserve data. See Volumes and data. --name Assigns a name to the container. These are the most commonly used docker run switches used in deploying DSE. 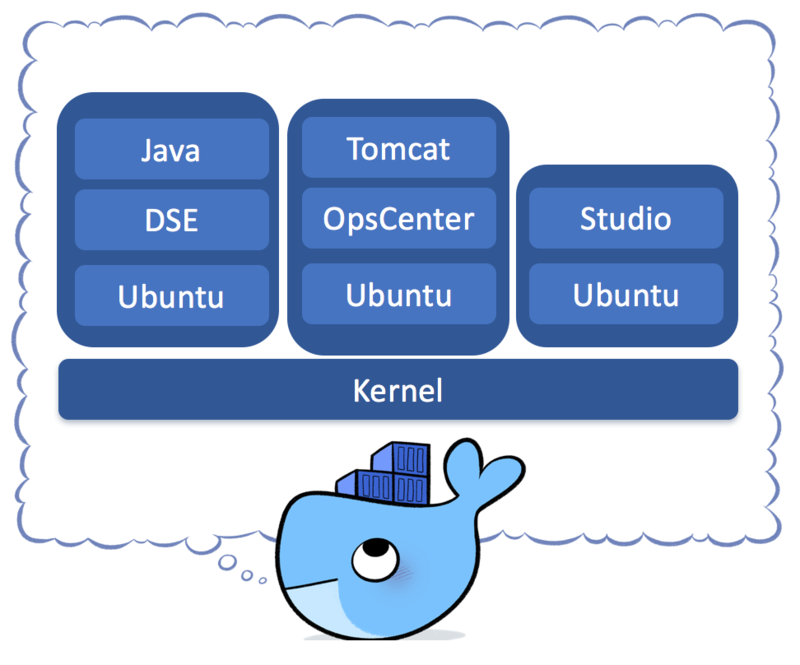 For a full list please see docker runreference. By default, the DSE server image is set up as a transactional (database) node. To set up the node with DSE advanced functionality, add the option that enables feature to the end of the docker run command. -s Enables and starts DSE Search. -k Enables and starts Analytics. -g Enables and starts a DSE Graph. You can combine the options to run more than one feature. For more examples, see the Starting DSE documentation. We started this container in the background by using the -d option. Use the following command to get an interactive shell to your DSE node. Easy right? Okay, we have more to learn. Exit that shell. We'll come back to it. Next we'll create an OpsCenter container. OpsCenter exists to manage DSE, so we'll need a dse-server node also. Create DataStax Enterprise server nodes, providing the link to the OpsCenter container using the Docker name. Get the IP Address of your your new DSE node. Open a browser and point to http://DOCKER_HOST_IP:8888. The Create the new connection dialog displays. The agent is already available on the DSE node, no installation is required. See OpsCenter documentation for further info on usage/configuration. Note that LCM is not supported and should not be used for containerized environments. Other tasks like scheduling commitlog backups would require writing a file in DSE which isn't possible in immutable containers. These tasks much be handled manually using DSE configuration files. Open your browser and point to http://DOCKER_HOST_IP:9091, create the new connection using my-dse as the hostname. Check Studio documentation for further instructions. Okay. Lets keep going. We need a cluster. Fun fact. Until the 'thing' is running it's an image. When running it's a container. Stale conversation at a party? Might I suggest this opener "Isn't it interesting that you don't actually call something a 'container' until it's running. Up to that point it's just an image. Bootstrapping a multi-node cluster with OpsCenter and Studio can be elegantly automated with Docker Compose. To get sample compose.yml files visit the following links. For simple use cases we’ve exposed common settings as environment variables. For advanced configuration management we’re providing a simple mechanism to let you change or modify configurations without replacing or customizing the containers. You can add any of the approved config files to a mounted host volume and we’ll handle the hard work of mapping them within the container. In this section we're giving that a try. DataStax provided Docker images include a start up script that swaps DSE configuration files found in the Volume /config with the configuration file in the default location on the container. Now we need to copy down a file that we want to customize. Now we need to change a value in the cassandra.yaml file. We'll change disk optimization from ssd to spinning. Something we'd never hope to need to change but a good and simple example. Adding a host volume is part of the docker run command so we need to stop and remove the running container. Lastly, lets verify our customized cassandra.yaml is being used. Remember, you can now put any number of the approved config files in this same directory.